“Arts education gives opportunities for creative expression and is crucial to the development of well balanced, healthy children.” – Brittany Dorris, 5th Grader teacher, Bethel School District. Which is why it’s so exciting to announce that so far, fundraising efforts by many generous donors and community partners have resulted in almost 75% of our $27,000 goal being raised! 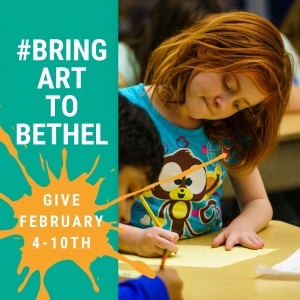 During the week of February 4th-10th, Lane Arts Council will launch an online digital giving campaign to raise the final $3,000, ensuring that all students in Bethel schools have access to the arts. Bethel School District, Lane County’s third-largest district, is home to over 5,600 students including 2,700 Bethel elementary school students. More than half of students in the district are eligible for free and reduced lunch and there are few arts programs available in the school and community. At the elementary level, the weight of integrating art into the classroom experience is dependent on the individual teacher, who may not be prepared with necessary skills and materials. For more information about this program and sponsorship benefits, please contact Liora Sponko at liora@lanearts.org or 541.485.2278. Thank you for investing in Bethel students!